Home > Blog > People who should have thought twice before getting a tattoo ! The woman who got an advert tattooed on her forehead: A woman over in America was paid 10 grand to have www.goldenpalace.com tattooed in enormous black letters on her forehead. Apparently, the money was to send her kids to university. The guy who got a ruler tattooed down the inside of his leg Ew, ew, ew. What is the purpose of this? Is it so people who see it get an ‘accurate’ measurement of certain parts of his anatomy? Whatever the reason, it’s totally gross. The girl who got 56 stars tattooed on her face Kimberly Vlaminck originally claimed she ‘fell asleep’ in the chair and the tattooist gave her 56 stars when she asked for 3. First – who sleeps through a tattoo? Second – no tattooist would ever, ever do that. Ever. When the story came out in the press, Kim was forced to admit she had actually asked to have 56 stars on her face and lied so her dad wouldn’t flip out. What a daft human. The guy who got his own face tattooed on the back of his head His bald head. So everyone could see it. Why would anyone do this? Who needs two faces? This is just unbelievably creepy and we’re a little stunned the tattoo artist agreed to it. Honourable mention: The people who get tattoos around their bellybutton that make their navel look like a specific orifice. It’s not big and it’s not clever. 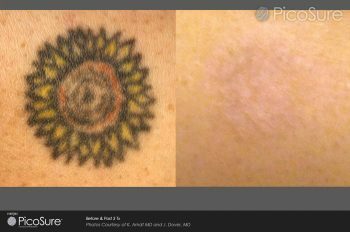 If you have a tattoo, which you regret or would like removed, please visit our tattoo removal treatments page.